Dogtooth pattern is becoming very fashion this season 2014. 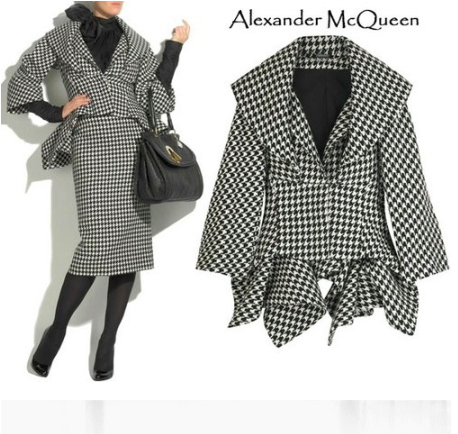 Designers like Marc Jacobs, Alexander McQueen and Chanel love to use dogtooth print in their winter collections, whether it be a cozy woolen coat or simple work wear. 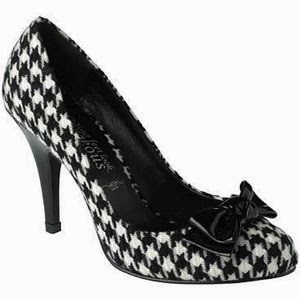 And it is not surprising since dogtooth is very beautiful print and you will look ladylike and chic wearing dogtooth. But how to wear this compound pattern? Let't look at pictures below. 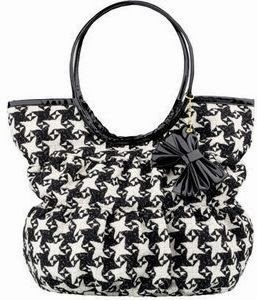 Fashionable dogtooth costume by Alexander McQueen. Chic jacket and pencil skirt. 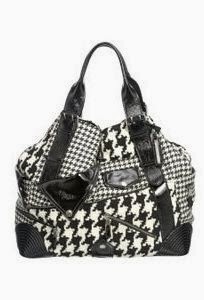 Dark clothes with a bright element like dogtooth bag. Elegant dogtooth dress with blue shoes and accessories. Dogtooth blouse. Low-key clothes in English style with a bright element. 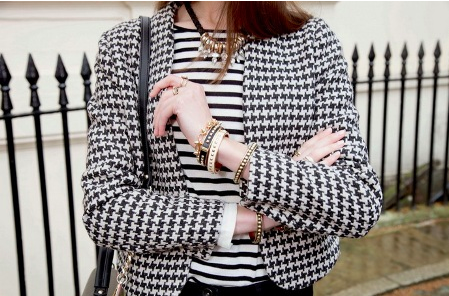 Dogtooth jacket with skinny jeans and high heels. 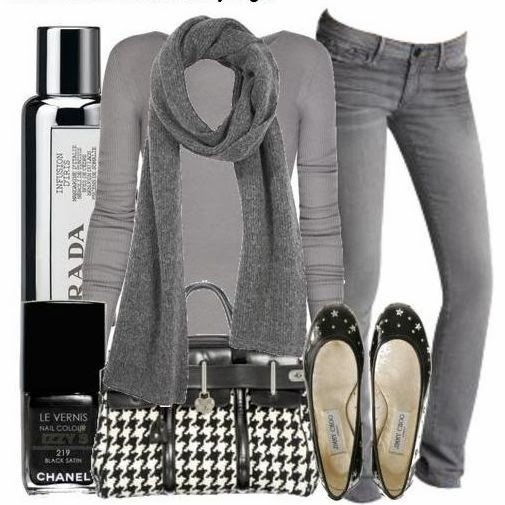 Dogtooth bag with gray clothes, skinny jeans and flats. Leather skirt with dog tooth tights and high heels. Dogtooth peplum top with black leather pencil skirt and dogtooth platform pumps. 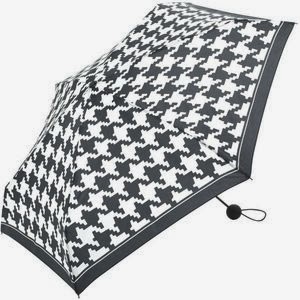 Dogtooth or houndstooth check is already a classic pattern. It was very popular some years ago. 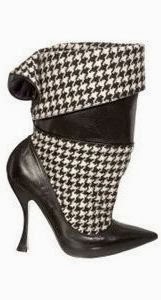 This winter dogtooth is gaining in popularity as well. In 2014 this classic pattern is not gonna leave the world's catwalks. 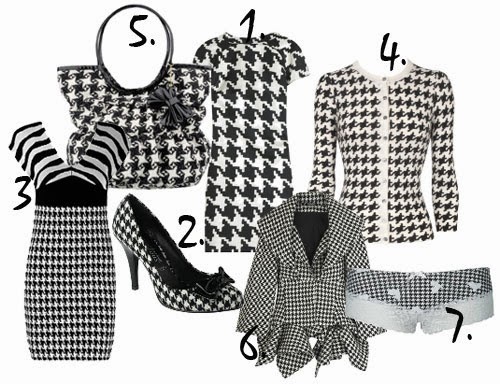 Dogtooth check is very compound pattern so it doesn't need bright accessories. Of course the hit of the season is black-and-white houndstooth, but celebrities like to wear it with red elements, silver accessories and classic pumps. Dogtooth check. Shoes and bags photos. Leather Clothes. How To Wear Leather. Let's talk about democratic fashion shopping. How to create a cerebrate style and to be trendy without going out. Having one leather jacked is not enough today. If you are a real fashionista you must have black leather pants, skirt and dress. High waisted leather skirt is a very good purchase if you want to look stylish. You can wear barred top and gold accessories with it. Leather pencil skirt is the must-have of this season. If you wear it with a blazer you will look beautiful in your office and at a party as well. Leather pants is a good alternative for your favourite jeans. Victoria Beckham shows us that it is possible to wear leather skirt with anything you like. A leather dress is a very eccentric thing. That's why it is better to wear dresses with leather decorating.